Industry water needs are continually on the increase. New commercial applications are being implemented to satisfy an ever increasing level of consumerism. The demand for water is becoming more urgent – particularly with the scarcity of rain being what it is. Regardless of what industry your business finds itself in, there is a growing need to have some form of back-up water supply. Don’t let your business come to a grinding halt because the Municipality might be experiencing a problem in their supply chain. You should in fact be trying to minimise your dependency on the municipality in a bid to lessen the burden on vital water supply infrastructures by having a viable alternate water supply. And you can! Your own water storage tank can mean that you have your own onsite, on-tap, ready-to-use alternate water supply! It’s this simple! It’s not only the convenience of being able to – oh dear, pardon the pun – “tap” into an alternate water supply source, just think of the money you could be saving using your own water! Even if you are in an industry that produces products for human consumption, our water storage containment solutions meet the highest standards. The sealed, non-corrosive, germ free and anti-contaminant inner liner ensures that all the hygiene factors necessary to store potable water, are addressed. The inner liner we use ensures that the contents of the liner do not come into contact with the outer frame. This way, you can eliminate contamination of the water inside. So, when you need it, your water is as pure as the day you saved it! And, if you’re in the mining industry, we can supply water tanks that can store up to 3 300Kℓ! Our Industrial water tanks are rugged and robust. The steel modular water tanks are perfectly suited to the rough terrain associated with the mining industry. 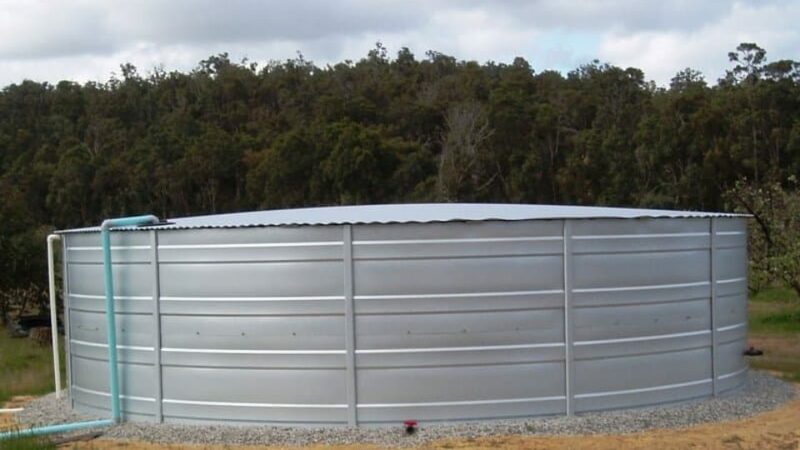 The water storage tanks can be constructed and installed exactly where you need it! All we need is a small area where we can put down a concrete foundation on which we can construct and erect a maximum sized 20 metre diameter (if you’re going for the gigantic 3 300Kℓ) circular tank. If, by chance, you’re in an Industry, like the mining industry, where a certain amount of toxic waste is a regrettable by-product, your Rainbow storage tank will solve that problem too! The encapsulated inner liner ensures that contamination either way, is eliminated! – So, if it’s waste or toxic by-products that is being stored, nothing inside would contaminate the outside! How do steel water tanks compare with plastic water tanks?